I was at a friend's baby shower a while back and she had all the attendees fill out messages for her coming darling. 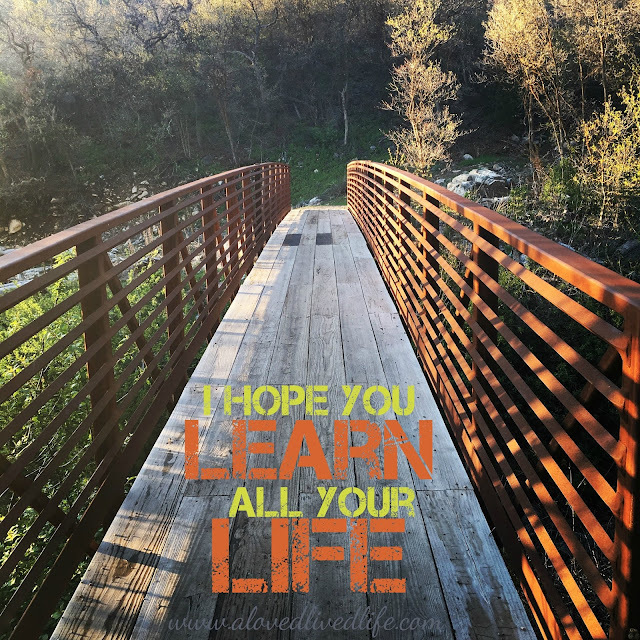 One of the prompts was, "I hope you learn..." and for me the answer was "all your life". We're big fan of continuing education classes offered through area universities and public school districts. In the past we've taken classes on watercolor, wheel thrown pottery, glass fusing, line dancing, and tai chi. This year, through Weber Universities Continuing Ed, we are taking a course on the Syrian Conflict. We often make class night our date night and go to dinner before or after class, depending on the timing. Beyond continuing ed class through schools near you, there are also online courses you can take. Check out the free classes through Harvard for example (wouldn't it be cool to say you've taken a Harvard course?). Many other top tier universities have online courses available, though they're not always free. You can also look for classes taught at area craft stores. Around here there are scrapbooking stores, quilting stores, and yarn stores that teach you mad skills. I learned tatting through Michaels. If you are an expert crafter, you could also teach some classes to earn some extra money (to supplement your lifelong learning habit). We've each taught classes in our areas of expertise; I've taught classes on knitting and Mr. Awesome has taught cooking classes and beer making classes. Kitchen stores, such as Sur La Table or local kitchen outlets, around here that would be For Your Kitchen, have cooking classes you can take. I know that some of our local nurseries teach various gardening classes, plus we have the Weber Conservation Learning Center, which offer gardening classes. If there's a national or state park near you, they often have ranger walks, which are fun ways to learn things and get out into nature. There are meetups that focus on learning. And if there aren't any meetups in your area, you can always start one to bring together people like yourself who want to build community and learn new things. Check out area museums too. And don't forget the library! Most libraries have various community activities and classes. And finally use your network for one-on-one learning opportunities. Maybe your neighbor is an expert fly fisherwoman or your friend knows all there is to know about building models. Most people are happy to share their knowledge. Pick their brains and learn from them if their hobby at all interests you, or even if it doesn't necessarily. You never know when you might need some of that knowledge to win at trivial pursuit or Jeopardy.